Illustration by A.L. 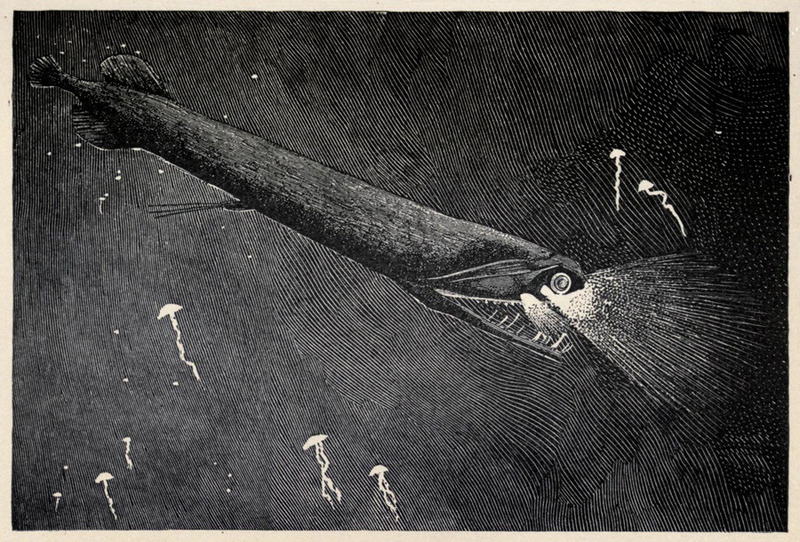 Clement for Charles Holder’s Living Lights: A Popular Account of Phosphorescent Animals and Vegetables (1887). I had a friend in college who would shut himself in his bedroom every afternoon and force himself to laugh at nothing in particular for exactly five minutes. It was one of the “Daily Habits of Joy and Excellence” that he’d recommended to himself and posted on the wall of his apartment: laugh for five minutes each day. Listening to him from the other room, you got a strange feeling. To think that you lived in a world where people would shut themselves in their rooms and laugh alone. How funny, or sad. My son, age nine, is a collector of jokes. That his father isn’t a collector of jokes is one of the great disappointments of his childhood. He only likes funny books these days. His favorites include Garfield comics and Tom Sawyer. He recently wanted something new to read so I handed him my copy of Code of the Woosters, warning that it may be premature. He gave it up after only two pages, bogged down by Bertie’s euphemisms for cocktails (“morning revivers,” “tissue-restorers”) and the implausibility of anyone being named Gussie Fink-Nottle. Humor, I think, is something we aspire to more often than achieve. But successful humor frequently comes from failure, from incompetence, from a sense of our inadequacy to the task of living – and life’s inadequacy to the task of being lived. Think of Cervantes, of Rabelais, and of Laurence Sterne. Among great American humorists I count Melville, Thomas Berger, and Peter De Vries. A fool on the stage means the play’s a tragedy, but it’s the jester who keeps us company when we’re wandering the barren heath. Note to Regular tNPs Readers (you hardy few! ): I have less time than I’d like to write for the blog these days, partly due to work pressures, partly due to an increased focus on other writing projects. I don’t want to be neglectful, however, so I’ve decided to repurpose some of my reading notes from the past year or two, in case anyone is interested. They’re bound to be a little rough, so caveat lector. This is a first installment. The Varieties of Scientific Experience collects the transcripts of Sagan’s 1985 Gifford Lectures (always given on the topic of “natural theology”), complete with beautifully printed images of the slides he shared while lecturing. As one might judge from the write-ups by Richard Dawkins and Sam Harris on the back of the volume, the book is being re-packaged these days as a relevant text for foot soldiers of the so-called New Atheism. I think it’s appropriate to be at least a little suspicious of this co-opting. When Sagan talks about astronomy and science in general, and the history of science, he really is compelling. His sense of awe and commitment to inquiry are infectious. But I wonder if his aim isn’t different than the aims of Dawkins and Harris et al. Sagan isn’t really interested in snuffing out any sense of, or longing for, the divine in his audience, but to deliver a lesson in epistemological humility. That said, the book frankly bores when Sagan ceases to lecture on science per se and moves on to dismantle the Mr. Potato Head arguments historically forwarded to (supposedly) demonstrate the existence of God. Anyone who’s sat through a basic Philosophy course in college and paid any amount of attention will know with what relative ease this may be done. But of course religion, whatever it is and for all its accretions over the millennia, is (like life itself) not founded upon or honestly reducible to rational argument or experimental demonstration. The title of Sagan’s book recalls the American philosopher William James’s The Varieties of Religious Experience, which was similarly drawn from his own Gifford Lectures, delivered eighty-some years earlier. These two books are not, despite the implication, arguing from diametrically opposed positions. Both are open and curious. But I think James’s book has aged better than Sagan’s (which suffers from scientific progress in his own field as well as from an excess of Cold War hand-wringing) and is, both literally and figuratively, more substantial. Compared to Sagan’s more focused concern, Robinson’s is vague and metaphysically loaded, but she spends most of her book arguing, in a roundabout way, that this fuzzier diagnosis is the only really satisfying one. I wonder if there’s a distinction to be made here between collective and individual ends. Solving Sagan’s problem would remove a mortal threat to the species as a whole, which is no small thing. But if you grant Robinson’s diagnosis, perhaps you’ll concede that successful management of it (she doesn’t envision a permanent solution) would probably contribute more to our individual self-knowledge and joy in life than the eternal bunkering of the arsenals of decayed superpowers. In another of her essays Robinson writes: “My point is that lacking the terms of religion, essential things cannot be said.” It strikes me that so much of Marilynne Robinson’s work, fiction and non-fiction, can be summed up in this single sentence. Not long ago, William Deresiewicz wrote a blog post for The American Scholar, titled ‘My Atheism: An Interim Report,’ in which he came to the same conclusion: that we need religious language in order to say the most important things (he actually invokes Robinson’s Gilead in his post). There is a real divide between persons, Deresiewicz says (I’m paraphrasing), but it’s not between believers and non-believers, it’s between people who imagine that truth is only a matter of factual statement about material phenomena and people who believe that there is an inward truth too, inaccessible to material investigation. There’s something to this, I think. Perhaps we might say that there are the Marilynne Robinsons of the world on the one hand, and (though it might be a bit unfair to him) the Carl Sagans on the other. This is not necessarily a division between “believers” and “atheists.” The late Christopher Hitchens, such a charming and exuberant blasphemer, might plausibly be a Robinson, as are most religious persons or persons (like Deresiewicz) raised in religious families. The difference that counts – and I see it all the time among my own friends, acquaintances and colleagues – is between those for whom stories are the most important thing in the world, and those for whom they are mere decoration. Human Felicity is produc’d not so much by great Pieces of good Fortune that seldom happen, as by little Advantages that occur every Day. Thus if you teach a poor Man to shave himself and keep his Razor in order, you may contribute more to the Happiness of his Life than in giving him 1000 Guineas. The Money may be soon spent, the Regret only remaining of having foolishly consum’d it. But in the other Case he escapes the frequent Vexation of waiting for Barbers, & of their sometimes dirty Fingers, offensive Breaths and dull Razors. A friend of mine recently visited a newfangled, old-fashioned barbershop in the city of San Francisco where he was seated in a barber’s chair, a hot towel was wrapped around his face, and he was shaved with a straight-edge razor, like Elmer Fudd in a Warner Brothers cartoon. “It’s a sort of man-spa,” he said. Nowadays, you see, we hand over our thousand guineas to subject ourselves to the dirty fingers and offensive breaths of the barber, and consider it luxury. This is perhaps necessary, however, and contributes to the general felicity of our fellow citizens, because spending money on things we could have done for ourselves, or done without, is almost the sole basis of our economy. The Whitebark’s cones do not open on their own. Its seeds are not spread by wind or fire. Only the Nutcracker can extract them. The bird will store between eighty and 100 seeds in its throat pouch and cache them away three or five or seven at a time in the shallow soil of rocky alpine slopes. 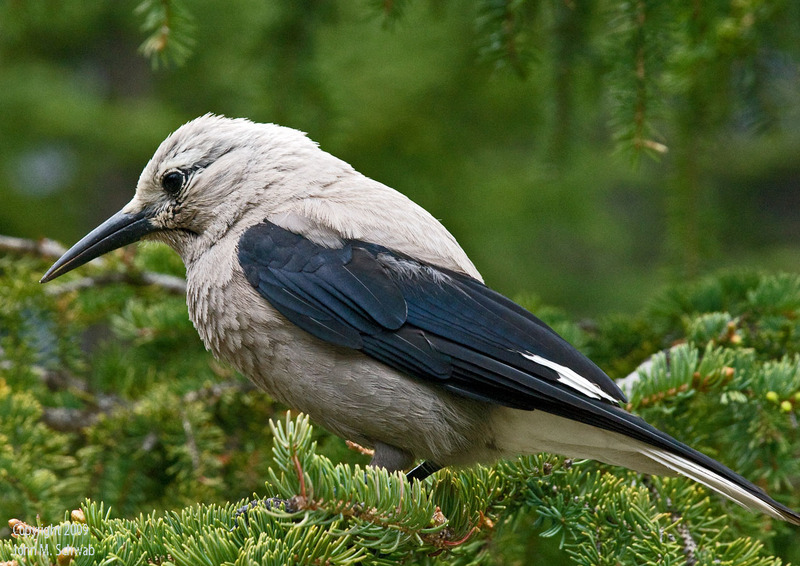 A single nutcracker will make over 9,000 caches each year and retrieve the seeds in winter by memory. A fraction of these are forgotten, or intentionally spared, and so the Whitebark grows, wherever it grows, in clumps of between three and seven trees. When they mature, after some sixty or eighty years, they produce cones of their own to tempt the descendents of the Nutcracker that first planted them. The ranger, a young man with a short beard and long hair and the earnest enthusiasm of a character from a Wes Anderson movie, drew the picture for us: Flying among the granite peaks and glacial valleys, the Clark’s Nutcracker surveys a landscape of very personal significance, not a wilderness but a family garden planted and tended by a thousand generations of his forebears, which he will tend in turn and leave for his children. Within his territory he knows, quite probably, every tree, every root. From our campsite at Tuolumne Meadows (at an elevation of 8,600 feet), we made a day hike up to Elizabeth Lake (9,600 feet), just below the granite horn of Unicorn Peak. This was no mean feat with two children in tow, considering the gain in elevation and the thin air. But while lunching on salami, apples, and hard-boiled eggs, we saw the Whitebark growing in small patches of krummholz, trunks and branches weather-tortured into grim, Dantean statuary, all knees and elbows and twisted necks. And flapping away across the water we saw what could only have been a nutcracker, a crow-sized bird with flashing white patches visible at the distance of a quarter mile. Back at camp, reading the old paperback I’d brought along (Benjamin Franklin’s Autobiography), it occurred to me that if we can expand the definition of “tree” and consider books – made of wood pulp, after all – a sort of sub-species, then I am deep in an arboreal mutualism of my own. My library at home becomes a tended forest, inherited down a makeshift genealogy from those (readers and writers) who have come before me. The books themselves provide me necessary nourishment and I, in turn, propagate them through lending and recommendation, and by keeping them in fair enough shape to pass on while they still have fruit to bear. Perhaps there’s a biological basis, then, and I’m not simply being a Luddite, for preferring real books printed on actual paper made of wood pulp over electronic books downloaded as digital files, to be read from a screen. Electronic books break the mutualism, sever the natural relationship, that we reading people have so long enjoyed. Some, I suppose, might see in the advent of the digital library a leap forward in the evolution of reading – another descent from the primordial trees onto the open savannah. I’ve always preferred the forest.